One thing that we can all be thankful for with our vehicles is the effort that manufacturers go through to make them unstealable. Having your car get stolen is a scenario that nobody wants to find themselves in, and it would disrupt your life in a major way. However, vehicle-makers are also concerned with our own convenience, and they want to make sure that continually entering and exiting our vehicle is as easy as possible, without us having to jump through hoops. It is for this reason that we have transponder keys and remote car keys. Unless you’re driving around a car that predates Jurassic Park, you probably got both of these with your vehicle when you bought it. 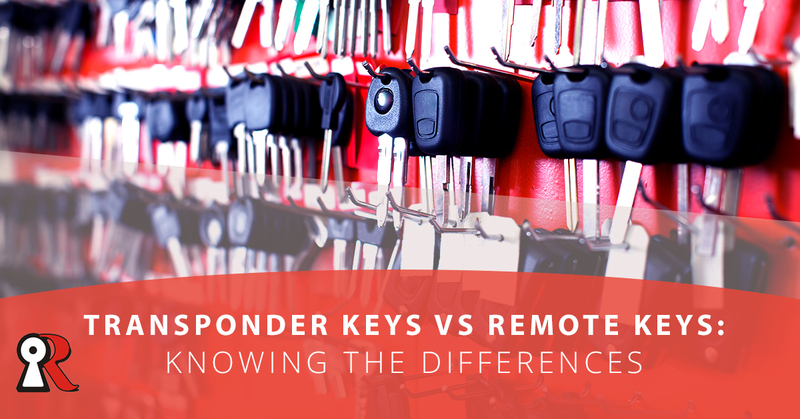 So, what’s the difference between a transponder key and a remote key, and more importantly, why should you care? Let’s take a look. Transponder keys, at first sight, appear to be normal keys. They have all the defining features of a typical key, and if you didn’t know any better, you’d have no idea that there is actually technology inside these little guys. These are the keys that you use to start your car, and you’ve probably handled countless transponder keys throughout your life. So, what makes a transponder key special? In a simple word — security. Have you ever wondered or even noticed that just about every car key has a fat black head that’s distinct from the blade? That’s because there’s special tech inside of it that interacts with your car every single time you start it up. The key responds to a special signal in your ignition lock, communicating to the car that it’s good to start up. Without this signal, the car won’t start, even if you have a perfect replica of the key blade. That makes cars exceptionally hard to steal. Without the original transponder key, your car isn’t going anywhere. While it’s technically called a remote key, the word “key” evokes the image of a traditional metal key with a head and blade. Most people refer to remote keys as key fobs, and if you’ve got one of those with a couple of buttons on it, that’s exactly what we’re talking about. Remote keys are designed for user convenience rather than security. Remote keys allow you to lock and unlock your car at will, which is much more timely and easy than putting your metal key in the lock every single time. While most cars in the 90s and 2000s came with one transponder key and one remote key, a lot of cars now are adopting wireless startup technology, where the car is started with a button instead of a key. In a lot of these cars, the remote key and transponder key are combined into one — a single key or fob that allows you to remotely open/lock your car, which also contains the technology that permits the car to start. The one downside to a transponder key is that they’re not quite as easy to just up and replace as a normal key that’s not beholden to any technology. However, at Redlands Lock and Key, we have the means to do it! Losing a key can be a frustrating experience that always seems to happen at the most inconvenient time, which is why we do everything in our power to provide you with a solution in the most timely manner possible. Contact us today!